Background: Why Clarence H. Mackay? 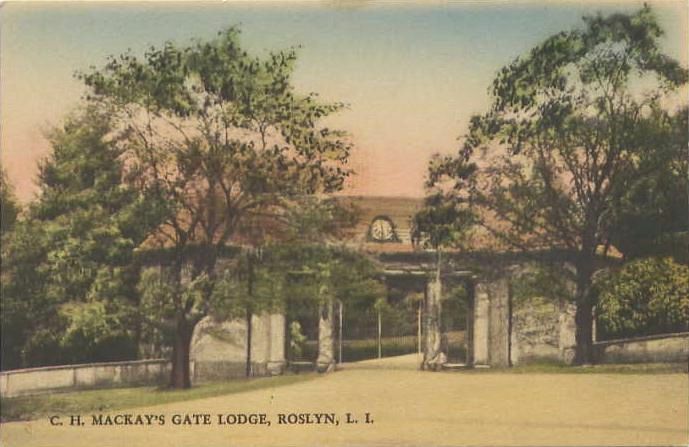 Interest in Clarence H. Mackay grew out of a June 1954 youthful discovery of the estate gate lodge pictured above. The gates had been padlocked for almost 16 years since the death of Mr. Mackay in November 1938. The stone walls were gone. The bluestone driveway behind the gates had disappeared as nature reclaimed the land. A difficult walk up hill through the wooded countryside behind these gates led me to an abandoned and overgrown hill top foundation. 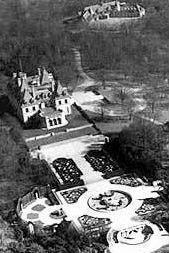 The foundation was not remarkable in and of itself but it still was surrounded by limestone terraces, low, stately balustrades and had the faint trace of a very large, crushed stone, circular driveway on its' southern side facing Harbor Hill Road. The balustrades and driveway made it obvious to me that a mansion had once stood on this hilltop site. But in 1954, nothing else remained on the top of Harbor Hill except lots of "volunteer" trees and thickly tangled underbrush. ..."What did the house look like that stood on this hill?" ..."Who was the family that lived here?" ..."What were the surrounding grounds and buildings like?" ..."What events, great and small, happened here?" ..."And why was this property abandoned? The Mackay fountain in the center of the formal Italian gardens to the left has resided in Kansas City, Missouri since it was rescued from a salvage yard in 1951. Today it is known as the J.C. Nichols Memorial Fountain and is a favorite meeting place for visitors to the J.C. Nichols Plaza. Click here to see the fountain as it appears today. I began researching answers to the questions above using the internet in 1999. Little did I realize at that time that the answers would reveal an intriguing family history complete with a fabulous rags-to-riches story linked to the California Gold Rush and the follow-on Nevada "Silver Rush", cutting-edge telecommunications technology of the 1880s, a glimpse inside the lifestyles of the "rich and famous" on Long Island's "Gold Coast" and the eventual loss of a family fortune during the stock market crash of October 1929 and the ensuing "Great Depression" of the 1930s. The follow-on pages of this website (about 75 pages as of Feb 2006) reflect some of the answers to my original questions and are an attempt to begin to elaborate on a few of the countless other story lines that relate to "The Mackays".